I watched this movie completely exhausted. I was so thankful it was in english, because there was moments I would lean back and just enjoy the two main characters talk. Thumbs up! 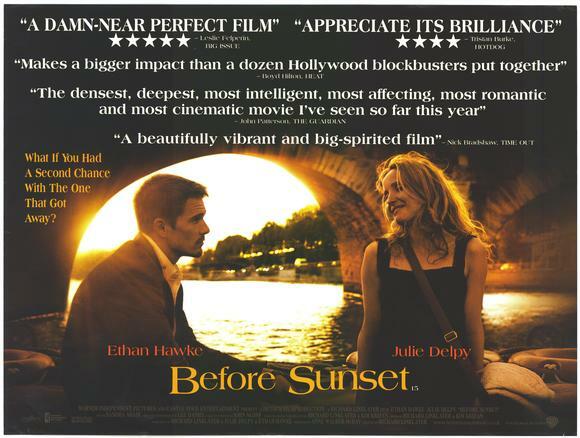 Before Sunset-directed by Richard Linklater, is an American Romantic-Drama. It was pretty romantic… and not too dramatic. I mean, it consisted of a conversation between two people. Of course the conversation was interesting and dramatic only in the sense of how much emotion they were using to explain what they were going through and feeling. The conversation happened between Jesse (the handsome american) and Céline (the pretty french lady). They met in Vienna 9 years earlier, had this romantic night and then just left each other- promising to meet up later, but never doing so. Luckily for you, there is an entire movie to explain it all- “Before Sunrise“. In this film though, Jesse is in France touring with a book he just published, focusing on the romantic encounter he had with this mysterious parisian. She shows up at the bookstore, ready to surprise and say hello to him. He’s obliviously shocked, and they both agree to go out for coffee quickly. He has to be at the airport in an hour, and they rush off to this cute coffee shop, in some super paris looking neighbourhood. He drinks coffee, she has lemonaide? Or at least something with lemon. They rest of the movie consists of just the conversation between them. It was refreshing, thought limiting. They talked about the ups and downs of the last nine years, their relationships, what they thought about each other- everything. I think my favourite part was the ending of the film. It was simple and sweet, though left you with a touch of mystery. The entirety of watching this, I was thinking how Céline reminds me of one of my close friends. Everything about her. I even started imagining if this was actually how dramatic and overbearing she might be with talking with the ones she loves intimately. I hope not… there was something fake about it. Maybe that’s just me being cynical. ps. This movie is apart of a trilogy. “Before Midnight” follows it. It was just released last year.